During the day I’m sold on the importance of a good breakfast to help with health, energy, and weight loss. But come early morning – I’m tired, hungry, and desperate for something quick to eat. Speed wins over quality every morning. Every night I think tomorrow I’ll eat something better and every morning I feel I only have time for cereal, a (sugary) muffin, or maybe just a coffee. Well I’m no longer a victim of myself. I’ve been on a hunt for quick and easy breakfast ideas, and I’m specifically looking for things that can be made in bulk ahead of time (in the evening when I’m motivated) so that in the morning I can grab-and-go. Tonight I’m setting myself up for a healthier tomorrow. 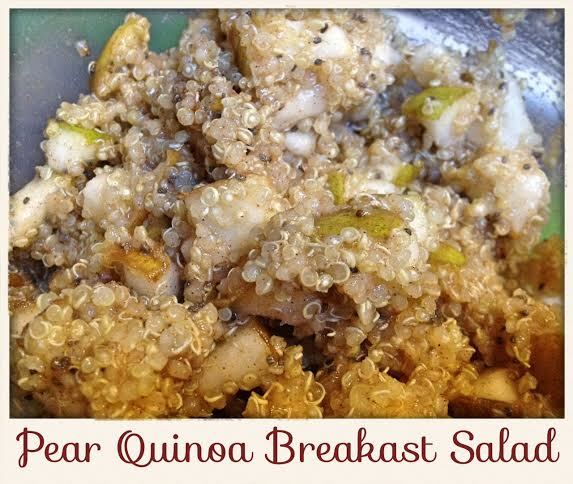 I made a batch of Pear Quinoa Breakfast Salad. It will sit in the fridge and provide breakfast for the week. No excuses. All I have to do is dish up and eat my healthy, protein-packed (did you know quinoa is full of complete proteins?) breakfast. The basic Pear Quinoa Breakfast Salad is good alone, and even better topped with plain Greek yogurt and honey. If you’re feeling really fancy, slice up banana or top with fresh or frozen berries. This recipe is gluten-free, and fits well into any clean-eating plan. The quinoa, Greek yogurt, and chia seeds (I sneak chia seeds into everything) have lots of protein; the fruit, honey, and coconut oil will give you a kick of energy to get your day going. So let’s get to it! Here’s the recipe for your new favorite gluten-free quick and easy high-protein energy boosting breakfast. 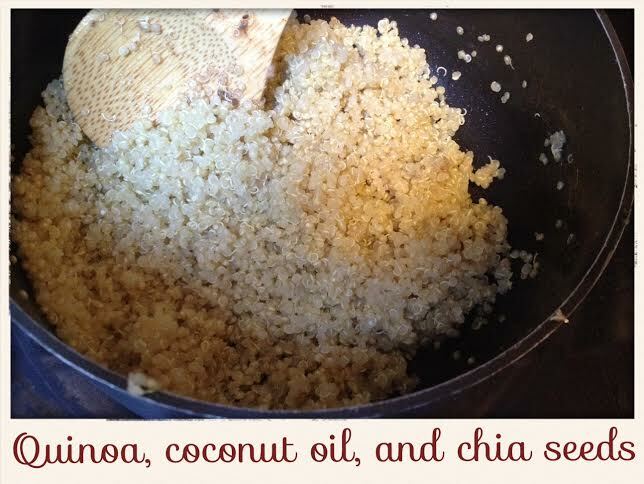 Add coconut oil to quinoa while cooking. I didn’t measure, I just added a big, rounded spoonful. Dice pear into bite size pieces. I washed mine well and left the skin on. 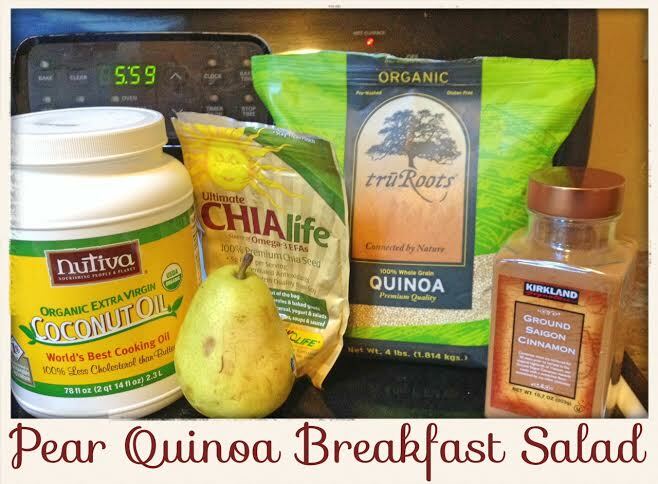 Mix quinoa, pears, cinnamon, and chia seeds. I didn’t measure the cinnamon either, I just dumped some in. And when I thought I had enough, I added a little bit more. Store in the fridge in your favorite Tupperware. 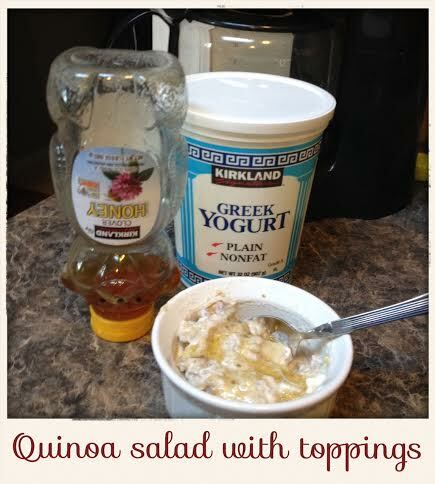 Dish up the chilled breakfast salad, top with Greek yogurt, and drizzle honey on top. 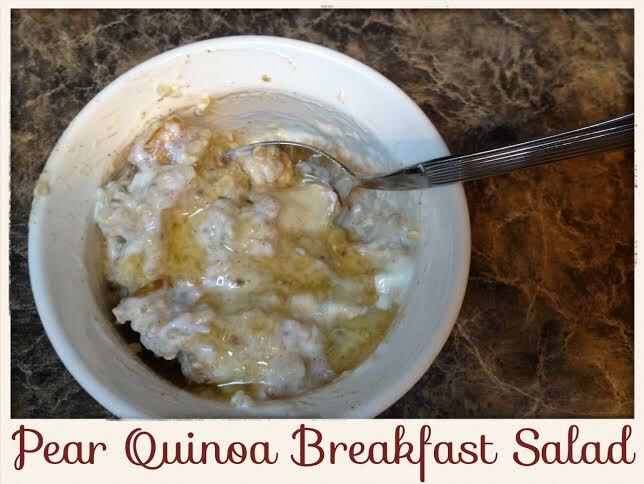 Want another easy breakfast idea? Give quiche a chance. Need quinoa? Buy some here.